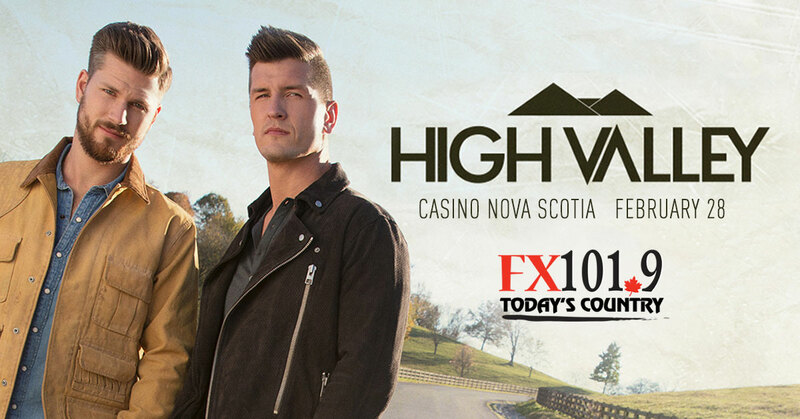 FX101.9 Presents High Valley at Casino Nova Scotia! With special guests, the Hunter Brothers! Two-time CCMA Award Group of the Year winners, High Valley will be bring their high energy show to the Schooner Showroom at Casino Nova Scotia on February 28th, 2019 at 7:30pm. Country fans are no strangers to the uncanny musical connection of a family band, but they’ve never heard anything like the duo High Valley – and that’s simply because brothers Brad and Curtis Rempel never knew how country was “supposed” to sound. Growing up in La Crete, Alberta – more than 2,500 miles from where they now live in Music City – Brad and Curtis were completely cut off from the world of pop culture throughout their early lives. While their upbringing didn’t exactly acquaint them with the Billboard 100, it’s that insulation that helped cement their musical ideals and love of simple, classic country, allowing High Valley’s music to feel simultaneously fresh and timeless. Dear Life, their recently released major label debut on Atlantic/Warner Music Nashville, is an album that fuses tradition with wide – eyed musical exploration, stays true to their family – first value system and celebrates resilient positivity. Likewise, they are the first country act to broadcast live on Twitch.TV in the United States and their song “Young Forever” scored placement on EA Sports’ Madden NFL 17 Soundtrack. The band has been selected for “Ones to Watch” recognition by Rolling Stone Country, Spotify, Pandora, CMT and Taste of Country. And they’ve been profiled on CBS This Morning for their unique and inspiring story and performed on NBC’s Today Show and on ABC’s Live with Kelly and Ryan. The Rempel brothers have already scored six Top 5 hit singles, a number 1 radio smash, seven gold single certifications (including 2 in the US), a gold record certification, two JUNO award nominations, an ACM nomination, a CMT nomination, played to 15,000 seat arenas opening for Shania Twain and earned multiple awards show wins – including Canadian CMA Group of the Year. And now with their major label debut, a fall tour with Old Dominion, and a winter Canadian Tour with icon Paul Brandt, it’s true that High Valley inhabit a much different world today than the one they were raised in.